What Else Can I Expect From an Online Master's in Education Administration Program? Educational administrators are responsible for ensuring that schools run smoothly. They monitor student achievement and progress, approve curricula and learning standards, create financial budgets and evaluate teacher performance. Professionals in educational administration include principals and vice principals, school secretaries, superintendents, college deans and admissions officers. Administrators work at every grade level, from preschool and kindergarten to colleges and universities, and are found in both public and private school settings. Education administration professionals reported an annual average salary of $92,360 in 2017, according to the BLS. Admission requirements for master's degree in education administration programs vary by school, but usually include a bachelor's degree, a minimum GPA requirement, standardized test scores, and prior teaching experience. WHAT CAN I DO WITH A DEGREE IN EDUCATIONAL ADMINISTRATION? Graduates with an online degree in educational administration can pursue careers as postsecondary education administrators, preschool and childcare center directors, instructional coordinators, and public school principals. Read more here..
Educational administration is a discipline within the field of education that emphasizes administrative theory and practice. Read more here..
IS A MASTER'S IN HIGHER EDUCATION ADMINISTRATION WORTH IT? A master's in higher education administration is worth it because it allows students to pursue nearly any administrative role in the higher education system without having to advance through a career in a high school or lower institution. Read more here..
Those pursuing a career in education administration usually have at least a bachelor's degree, state teaching licensure, and prior experience as a teacher. Many professionals earn a master's degree, and some earn a doctorate in education administration. Read more here..
At the master's degree level, students in this field learn about the challenges and issues facing our current education system, as well as strategies and innovations that directly address these concerns. Courses include subjects like educational law and ethics, measuring student engagement, faculty management and school finance. The majority of educational administration master's programs also involve practicum (or onsite) courses, which allow students to receive supervised training from experienced professionals in real-life school settings. A capstone course is often required as well, giving students the opportunity to demonstrate the knowledge and skills they have gained through a comprehensive research project. Many of today's students are choosing to earn their master's in educational administration online, rather than in a classroom. Online degree programs follow the same rigorous curriculum as brick-and-mortar options, leading to the same number of job offers for successful graduates. The online learning schedule is also ideal for students with part-time jobs, childcare duties and other responsibilities that may interfere with campus-based learning. WILL AN ONLINE MASTER'S IN EDUCATIONAL ADMINISTRATION PROVIDE ME WITH THE SKILLS I NEED TO ADVANCE MY CAREER? A master's degree is considered the minimum academic requirement for most educational administration positions, so graduates with this credential will be well-positioned to compete in the job market against candidates with a bachelor's or less. The majority of these master's programs allow students to concentrate on one age group or area of educational administration; a master's specialization will further boost a student's career standing. Additionally, certain professionals in this field ― such as school principals ― must become licensed as school administrators in the state where they wish to work. 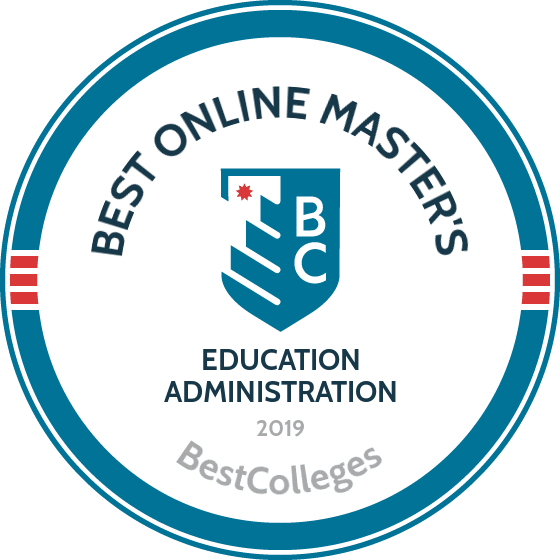 The best online educational administration master's programs prepare students for licensure exams and other state-level post-degree requirements. WILL AN ONLINE MASTER'S IN EDUCATIONAL ADMINISTRATION WORK WITH MY SCHEDULE? Online master's degree programs offer a flexible alternative to traditional college education. Students are able to access course lectures and readings, submit assignments, participate in virtual discussions with other students, take exams and communicate with their professors ― all from the comfort of their home computer. Current technology also allows them to study on the go using a laptop, tablet, smartphone and other portable Wi-Fi devices. For added convenience, online students can arrange practicum courses at schools and other sites that are reasonably close to their current residence, rather than commuting long distances. WHAT JOBS CAN I GET WITH MY MASTER'S IN EDUCATIONAL ADMINISTRATION? Students with an educational administration master's degree will be qualified to become principals, vice principals and other administrators at the K-12 level. They may also be eligible for district positions, working alongside school superintendents to manage all schools in a given area. Certain careers in educational administration, including deans and other postsecondary professions, typically require candidates to hold a doctoral degree. A master's in educational administration will provide foundational knowledge and skills for students who wish to obtain a doctorate. WHAT ARE THE BEST ONLINE MASTER'S IN EDUCATIONAL ADMINISTRATION PROGRAMS? Choosing a program is an incredibly personal decision, and only you can properly evaluate whether a target school's strengths match your educational needs. The following ranked list of schools should serve as a helpful starting point in your search for the best online master's in educational administration programs in the United States. If you are considering an online master's in educational administration, be sure to contact admissions specialists at different colleges and universities to learn more their about specific master's in educational leadership degree requirements and offerings. North Carolina State University at Raleigh provides higher education coursework to over 35,000 students each year. NC State provides a hands-on learning experience by maintaining a 13-to-1 student-to-faculty ratio. NC State's online master's in education administration qualifies graduates for leadership roles in K-12 schools by cultivating dynamic leadership and strategy development skills. This program includes 42 credits split between eight courses and a year-long internship. While interning, students observe educational situations, analyze outcomes and consequences of events, and consider alternative actions. Students who successfully complete this program qualify for state licensure in North Carolina. To qualify for admission, applicants must possess three years of teaching experience, hold a current job in a K-12 facility, and take the GRE or MAT. Students employed full time may not exceed 12 credit hours each semester. NC State also holds accreditation from the Southern Association of Colleges and Schools Commission on Colleges (SACSCOC). NC State designs its online programs with nontraditional students in mind. Therefore, some courses offer synchronous learning, which allow students to attend class online through video chat. Most online courses follow an asynchronous format, providing students optimal flexibility. Students engage in online discussions, video lectures, essays, and exams through an online learning management system. Courses typically include online office hours where students can interact with professors through live chats or over the phone. Located in Baltimore, Maryland, Johns Hopkins University has provided higher education to students worldwide for over 140 years. Johns Hopkins encourages innovation in all areas of study. Many prominent figures either taught or attended Johns Hopkins, including Woodrow Wilson and John B. Watson, the father of behaviorism. Education professionals seeking to expand their career opportunities can earn an online master's in education administration at Johns Hopkins. Reflecting the same rigorous coursework on-campus students experience, distance learners use evidence-based research to examine current challenges in school leadership and develop sustainable solutions. Johns Hopkins offers two study tracks. The flexible option allows certified teachers to complete the 18-credit hour program at their own pace, while the JHU Teach For America Corps member track offers an accelerated, two-year program. Distinctive coursework includes effective leadership, which emphasizes the diagnosis of school climate, behavior, and motivation to develop school improvement goals. Students engage in a supervised, culminating internship experience where they apply competencies and skills acquired throughout the program. This internship requires 200 hours of performance and observation, a reflection essay, and a portfolio. To qualify for admission, students must possess a current teaching license with at least 27 months of experience. Johns Hopkins University retains regional accreditation through the Middle States Commission on Higher Education (MSCHE). Simultaneously, Johns Hopkins holds programmatic accreditation from the Maryland State Department of Education (MSDE) and the Council for Accreditation of Counseling and Related Educational Programs (CACREP). The university also participates in the NC-SARA agreement, which awards reciprocity for tuition in member states. Stony Brook University belongs to the State University of New York system, which includes three other schools. Founded in 1957, the university has grown, gaining recognition as one of the top universities worldwide and among the best public schools for overall value. Higher education professionals seeking leadership careers can enroll in Stony Brook's higher education administration master's program online. Students enrolled full time can complete this 36-credit program in 16 months. The first 18 credits include core coursework and a project seminar. With the remaining credits, distance learners select relevant elective courses that reflect their future career goals. Notable courses include philanthropy in American higher education, comparative university systems, and crisis management. Students also engage in two practicum experiences. While Stony Brook offers all coursework online, higher education students may choose to participate in study abroad experiences in Italy or China. To qualify for admission, students must possess a 3.0 GPA from a regionally accredited undergraduate program. Stony Brook's master of arts in higher education administration does not require the GRE. However, students must provide two letters of recommendation and a personal statement. Stony Brook's higher education administration master's program online follows 10-week terms year-round and offers multiple start dates. Stony Brook uses the Blackboard online learning management system to deliver mostly asynchronous courses, which allows students to learn course materials on their own time within deadline dates. Distance learners receive support through online access to librarians, academic advisers, 24/7 technical assistance, and tutors at the writing center. Stony Brook also provides telephone counseling and psychological services. Stony Brook retains regional accreditation through the Higher Learning Commission (HLC). Originally established in 1871, Texas A&M University-College Station became the state flagship school in 1948. The school now enrolls nearly 70,000 students each year. Texas A&M has gained recognition as a best value and top-ranking public school that emphasizes research, innovation, service to society, and leadership. Postsecondary professionals striving to elevate their careers can enroll in the higher education administration master's program online at Texas A&M. Graduates learn how to address issues with admission, evaluation, curriculum, culture, and policy. This program requires 42 credits, including 12 core course credits and 30 elective credits, allowing students to tailor their education to meet career goals. Texas A&M designs its distance programs with nontraditional students in mind. Students working full time often complete the program in three years with part-time attendance. However, students may also enroll full time to graduate sooner. Texas A&M offers assistantships for qualifying students. Distance learners also receive support through the online academic success center, career center, the office of graduate and professional studies, the university writing center, and technical support. Texas A&M does not require a specific GPA or the GRE to gain admittance. Instead, the school looks for applicants who possess a combination of experience and clear direction in their career in addition to transcripts. Texas A&M holds regional accreditation from the Southern Association of Colleges and Schools Commission on Colleges (SACSCOC). Located in Clinton, Mississippi College stands as the oldest higher education institution in the state and the second oldest Baptist college in the United States. MC has gained recognition for the quality and overall value of its education programs. Higher education professionals seeking to elevate their career can enroll in MC's online master's in education administration. The program requires 27 credit hours and two practicum field experiences. Most students complete the program in 18 months. Distinctive coursework includes student development theories, ethics and inquiry, and finance in higher education. The online learning management system for distance courses at MC primarily follow asynchronous learning, which allows students to complete work within weekly deadline dates. Students engage in online discussion boards, group projects, essays, and exams. However, some courses use synchronous formats where students engage in live video sessions. Students receive feedback on assignments within 48 hours, and professors offer online or telephone office hours. MC provides online tutoring, 24/7 technical assistance, and academic advisers to ensure student success. Students can also access online databases and contact librarians for research support over the phone. To qualify for enrollment, students must hold a 2.5 GPA from a regionally accredited university, a valid teacher's license, teaching experience, and letters of recommendation. MC also accepts up to six transfer credit hours with dean approval. The school of education at Mississippi College holds multiple programmatic accreditations and regional accreditation by the Southern Association of Colleges and Schools Commission on Colleges (SACSCOC). Based in Massachusetts, Boston University offers hundreds of programs to over 34,000 students each year, making the school among the top employers in the city. Despite the school's size, BU classes typically do not exceed a 10-to-1 student-to-faculty ratio. Over the past 25 years, the BU Wheelock College of Education and Human Development has grown to become one of the best colleges for education in the United States. Education professionals working with post-secondary populations can enroll in BU's online master's in higher education administration, which emphasizes theory application. This program includes a concentration in educational leadership and policy studies to ensure that graduates understand the landscape of problems that influence higher education institutions. Noteworthy courses include diversity and justice in higher education and perspectives on higher education. This program utilizes a part-time format and requires 36 credits. Each course lasts seven weeks, with two courses per semester. Most students complete the program in about two years. The BU online master's in education administration does not lead to licensure. Most courses utilize an asynchronous format, which provides optimal flexibility and allows learners to complete all coursework online. Students often receive a syllabus at the beginning of the course that indicates all deadlines. However, some courses require real-time interaction through video sessions. To apply, Wheelock College of Education requires an equity and inclusion statement, a statement of objectives, a resume, and two letters of recommendation. BU also requires either GRE or MAT test scores. George Washington University offers an urban postsecondary experience in downtown Washington, D.C. Since 1821, GW has sought to uphold George Washington's vision of a high quality intellectual hub for emerging professionals to acquire pertinent knowledge and skills. The school possesses influential partnerships with leading organizations across multiple fields, providing a vast network to students and alumni. For over 30 years, the Graduate School of Education and Human Development at GW has offered exceptional coursework in educational leadership and administration. Alongside traditional program options, aspiring education leaders can complete an online master's in education administration without any on-campus attendance. This program provides pertinent skills needed to effectively lead institutions and focuses on cultural competence in diverse communities. For instance, core courses include leadership for equity and social justice or instructional leadership for school improvement. This 30-credit-hour program qualifies graduates for a state principal license. Therefore, students must complete an administration internship in a standards-based, PK-12 educational facility. Most students complete the program within two years. To qualify, the Graduate School of Education and Human Development at GW requires applicants to possess at least one year of teaching experience. Other requirements include a resume, statement of purpose, and two letters of recommendation. At least one recommendation letter must come from applicants' current administrator. GW retains national accredited by the National Council for Accreditation of Teacher Education (NCATE) and nationally recognized by the Educational Leadership Constituent Council (ELCC). GW also holds regional accreditation through the Middle States Commission on Higher Education (MSCHE). Florida State University began in Tallahassee during 1851. Since then, FSU has gained recognition as an elite public postsecondary institution. For instance, the FSU College of Education offers internationally praised professors who engage students in leading research, uncover innovative teaching methods, and examine the latest educational policy and legislation. FSU offers an online master's in education administration for current education professionals seeking leadership positions. The program examines pertinent leadership knowledge and skills with an emphasis in academic training and effective application. Core coursework includes leadership for diversity and instructional leadership. Other pertinent courses include legal aspects of public school administration and resource management for educational leaders. This 33-credit-hour program requires a practicum experience where students apply acquired knowledge and skills to generate positive impact. FSU also requires a culminating exam at the end of the program. To qualify, students need a bachelor's degree from a regionally accredited university, a minimum 3.0 GPA, a current Florida professional educator's license, and at least two years of classroom teaching experience. Applicants must also submit their two most recent performance evaluations and GRE scores. Students can earn their degree online with no in-person requirements. FSU courses use an asynchronous structure, allowing students to complete assignments on their own time prior to deadlines. Following a traditional semester schedule, students can earn their degree in six semesters. FSU provides online students with specific academic help, such as technical support and one-on-one tutoring services. Regarded as one of the top colleges for education in the U.S., the University of Illinois at Urbana-Champaign offers rigorous programs that emphasize innovative research and transformative educational experiences. While the university has offered traditional access to higher education for over 150 years, Illinois also strives to accommodate nontraditional learners through its 90 online degree offerings. Through the Illinois College of Education, professionals working in K-12 settings can earn an online master's in education administration to boost their career. This program requires 36 hours, which includes 32 core course credits and four educational psychology foundations hours. Distinctive core courses include leading learning-centered schools, political and cultural context of education, and public school finance. Graduates qualify for an Illinois principal's license for K-12 schools. Therefore, core coursework includes a direct clinical administrative experience where students explore current administrator concerns and develop innovative solutions. Many online courses at Illinois follow an asynchronous learning method, providing students optimal flexibility. However, some courses require live, synchronous sessions. Illinois also provides support for distance learners. The center for writing studies offers tutoring and workshops, and the center for innovation in teaching and learning holds many valuable resources for distance learners. Similarly, the Illinois librarians provide reference and research assistance. To qualify for enrollment, the Illinois College of Education requires two years of teaching experience, a bachelor's degree from a regionally accredited university with a minimum 3.0 GPA, three reference letters, a resume, and a personal statement. The University of Illinois holds regional accreditation through the Higher Learning Commision (HLC). The University of South Carolina-Columbia dates back to 1801, initially enrolling just nine students. USC now offers over 350 programs to approximately 29,000 students each year. The university has gained recognition for best value, best public university honors college, and top-10 graduate programs in the United States. USC has also earned accolades from the Carnegie Foundation designation in community engagement and research activity. K-12 education professionals considering leadership roles can earn an online master's in education administration at USC. The College of Education offers a 15-to-1 student-to-faculty ratio, $7 million in research funding, and programmatic accreditation by the National Council for Accreditation of Teacher Education (NCATE). USC's online master's degree in educational administration requires 36 units, which most students can complete within 24 months. Notable coursework includes supervision of instruction, legal basis of educational organization and administration, and school personnel administration. This program qualifies graduates to take their state licensing exam. USC offers two tracks based on the student population learners plan: elementary school principal in practice and high school principal in practice. Online course formats vary between synchronous and asynchronous learning. USC uses the Blackboard learning management system and Adobe Connect to administer all coursework. To qualify for admission, USC requires a minimum 2.5 GPA from an accredited university, MAT or GRE scores, two letters of recommendation, a statement of intent, a valid teaching license, and a resume. USC Columbia holds regional accreditation by the Southern Association of Colleges and Schools Commission on Colleges (SACSCOC). Based in Irvine, California, Brandman University offers a small, private postsecondary education with a competitive acceptance rate. Brandman values academic excellence and flexibility. With focus on nontraditional learners, the university has gained recognition as a top online school. Working education professionals with a valid Commission on Teacher Credentialing-approved Preliminary Administrative Services Credential can earn an online online master's in education administration at Brandman. This program includes 30 credits, including 18 core curriculum credits and 12 elective credits. Core courses include democracy, education, and social change or a seminar in the social foundations of education. Brandman offers all coursework online. However, students may select the hybrid option, which offers some in-person experiences. Most courses follow an asynchronous format to accommodate students' schedules using the Blackboard online management system. Assignments include weekly discussion posts, group projects, exams, and essays. Brandman also provides additional services for distance learners. For instance, the Center for Instructional Innovation offers technology assistance, LiveText helps students align their assignments with federal and state standards, and the online writing and math center allows students to access tutors. Brandman offers four GPA admission options to accommodate more students, including applicants with a minimum 3.0 GPA; applicants with a 2.5-2.99 GPA and either GRE, GMAT, CSET, or MAT scores; applicants who already earned a master's degree from an accredited university; and applicants with a portfolio that displays writing samples, reference letters, a resume, and a letter explaining why Brandman University should consider the applicant. The University of Nebraska-Lincoln stands as the oldest and largest post secondary institution in the state. With deeply rooted values in research and modernization, UNL has achieved many accolades, such as the world's first undergraduate psychology laboratory and recognition as a leading teaching institution. The UNL College of Education and Human Sciences strives to prepare future education professionals to impact in the lives of diverse student populations and their families. Aspiring leaders can enroll in UNL's online master's in education administration. Applicants seeking to work with primary and secondary students should select UNL's master of education with an emphasis in P-12 school leadership. Students who wish to help postsecondary students may consider UNL's 37-43-credit higher education administration track that also offers a student affairs administration specialization. UNL's distance education system designs curriculum through cutting-edge pedagogy and technology. Students can access all online coursework through the Canvas learning management system. To provide complete flexibility, many courses utilize asynchronous learning by providing a syllabus at the beginning of the course containing all deadline dates. However, some courses require live videoconferencing. UNL provides academic support for distance learners through the online writing and media center and the UNL tutoring program. UNL also provides separate tutoring services for math, statistics, and chemistry. Students collaborate with an academic coach throughout the program. However, students who struggle with more personal issues can access counseling and psychological services. Licensed Florida teachers planning to enter administrative roles in their school or district need an advanced degree, such as NSU's master of science in education with a specialization in educational leadership. The program satisfies Florida's requirements for educational leadership certification. The 36-credit curriculum includes 12 synchronous courses in areas including educational research for practitioners, school leadership, and school law for administrators. Near the end of the program, students complete a 300-hour administrative internship at the school in which they work. Interns work under an experienced administrator and maintain a portfolio for professors to review. To remain in good academic standing, both in-state and out-of-state students must maintain a 3.0 GPA and pass the Florida Educational Leadership Examination. Out-of-state students earning the online master's in education administration should ensure the curriculum meets their state's certification requirements. Students should check with the National Association of State Directors of Teacher Education and Certification Interstate Agreement for information about licensure reciprocity. Applicants must hold an active teaching license or certificate and a minimum 3.0 undergraduate GPA. Applicants must submit a recommendation letter from a current work supervisor; the program only accepts current education professionals. All online students pay the same per-credit tuition rate, regardless of residency status, and NSU offers scholarship opportunities for online graduate students. NSU holds accreditation from the Southern Association of Colleges and Schools. A Christian institution, Columbia International University offers an online master of education in educational administration program. The fully online program prepares students to perform educational research, collaborate with other administrators, and apply the latest theories when making decisions. Full-time students can earn the online master's degree in educational administration in as few as five semesters. The 30-credit hour, asynchronous program includes courses in institutional advancement, supervision of instruction, and authentic assessment. Learners also take courses in chapel and biblical foundations for curriculum. To keep students on track for graduation, CIU offers a suggested course schedule for full-time students. The university allows part-time students up to six years to earn the degree. Students can customize their degree by pursuing an additional concentration in instruction and learning, which requires three extra courses. To remain in good standing, students must earn a grade of at least C in each course. Applicants must hold a minimum 2.75 undergraduate GPA and must have either two years of teaching experience, an active teaching license, or two years of educational administration experience. CIU occasionally waives the professional experience requirement. All students in the program pay the same per-credit tuition rate, regardless of enrollment status. However, full-time students pay slightly higher fees each semester. CIU holds accreditation from the Southern Association of Colleges and Schools, the Association for Biblical Higher Education, and the Association of Theological Schools. Students in Appalachian's part-time master of school administration program gain the knowledge and skills necessary to lead elementary, middle, and high schools. Most students graduate in six semesters. Graduates often work as assistant principals, principals, and department administrators. The curriculum comprises 36 credit hours and blends synchronous, asynchronous, and in-person learning formats. Students attend scheduled, remote courses in the evenings, view recorded lectures at their convenience, and complete an internship practicum in their community. This online master's in education administration offers electives including school finance, leading change in education, and critical inquiry and thought in educational leadership. This online master's in education administration qualifies graduates for North Carolina principal licensure. Out-of-state learners should check with their state's education department to determine whether the program meets requirements for their state. The program's cohort model enables online students to form professional relationships with peers. Students can apply for the spring or fall semester. Applicants must have at least three years of teaching experience, an active teaching license, and MAT or GRE scores from the past five years. Applicants must also submit three recommendation letters and a personal statement. North Carolina residents save approximately 75% on tuition, and active military personnel receive a tuition discount. In certain circumstances, Appalachian accepts military credit from active military members and veterans. CSUN offers a master of arts in educational administration that is ideal for employers who want to ensure their organization's success. CSUN only offers the program to organizations, such as school districts, willing to sponsor an incoming cohort. The program uses an entirely online format, and cohorts graduate in two years. This unique online master's degree in educational administration prepares graduates to work in administrative positions at the school and district levels. To ensure the online program mimics the on-campus experience, CSUN caps cohorts at 35 students. A program manager provides individualized assistance to each student, and learners can select one or more specializations through CSUN's stackable curriculum. Cohorts take one course at a time. All professors who teach online courses also teach classes on campus. Because CSUN's online master's in education administration program only accepts students as part of a sponsored cohort, the sponsoring agency sets application and eligibility requirements. Teachers typically need many years of professional experience and demonstrated leadership potential. All students pay the same per-credit tuition rate; some sponsoring agencies pay for their teachers to complete the program. Online students can qualify for university-funded scholarships. Veterans receive additional academic and financial support. CSUN holds accreditation from the Western Association of Schools and Colleges. All of the university's graduate education programs hold accreditation from the Council for the Accreditation of Educator Preparation. The online MA in education in educational administration program at CUI qualifies graduates for a state administrative services credential and is ideal for experienced California teachers. The online master's in education administration program uses a cohort learning model, and students graduate in two years. The 30-credit, synchronous curriculum requires six foundational courses, including curriculum evaluation, human resources, and instructional and transformational leadership. After completing foundational coursework, students undertake six practicum experiences totalling 100 hours. Although students can earn the degree entirely online, the university encourages students to attend occasional on-campus weekend symposiums to network and collaborate with peers and professors. Learners can also network through virtual conferences. Applicants must hold at least two years of professional experience and a minimum 2.7 undergraduate GPA. They must submit two reference letters and currently work in education. A private university, CUI charges the same per-credit tuition rates to all students. Online graduate students pay no additional fees, including technology fees. Because of the program's highly specialized curriculum, CUI does not accept transfer credits. Prospective students can apply for fall, spring, or summer start dates. The educational administration program may not meet requirements for principal certification in other states. CUI holds accreditation from the Western Association of Schools and Colleges and the California Commission on Teacher Credentialing. SDSU offers an online master of arts in education with a concentration in educational leadership and a specialization in preK-12. The technology-focused program prepares California teachers for administrative careers throughout the United States. This online master's degree in educational administration offers a specialization in preK-12, which is ideal for students preparing for principal or vice principal positions. Cohorts complete the program in 15 months, and graduates who do not enter careers in school administration often pursue educational technology leadership positions at the school and district levels. The 10-course, synchronous program emphasizes coursework in methods of inquiry, visionary leadership, and school improvement leadership. During the second and third semesters, students complete a master's project seminar that involves developing and conducting a research project in a school setting. All courses emphasize technology's evolving role in education, and students gain essential communication and research skills. Application requirements include an active California teaching certificate, two recommendation letters, and at least five years of teaching experience. The program does not admit San Diego County residents. Prospective students can apply for the fall or spring cohorts. As the program only accepts California teachers, all students pay the in-state tuition rate. SDSU awards various scholarships to incoming students who demonstrate academic merit; consideration for these scholarships requires an additional application. SDSU holds accreditation from the Western Association of Schools and Colleges. UW-La Crosse offers a master of science in education in student affairs administration designed for in-state and out-of-state educators planning to enter higher education leadership positions. Cohort size averages 16 students, so learners receive individual attention from professors. Students graduate in two years. This 36-credit master's in higher education administration online program includes courses in social justice and inclusion, student development theory, and leadership and organizational theories. Students undertake a 70-hour practicum experience in a higher education setting other than their place of employment. Students who work full time can substitute alternate assignments for the practicum. The online master's in higher education administration program concludes with a capstone experience during which students research contemporary issues in higher education administration, write a thesis, and present their findings to professors. UW-La Crosse highly prefers applicants with a minimum 3.0 GPA. The program occasionally accepts applicants with lower GPAs who possess other exemplary qualities. Applicants submit a four-page personal statement and may need to participate in an interview on campus or through Skype. All online students pay the same tuition rates, and Wisconsin residents who are part of a minority group may qualify for an Advanced Opportunity Grant. UW-La Crosse holds accreditation from the Higher Learning Commission. Cal State Fullerton offers an online MS in educational administration and/or preliminary administrative services credential with three available tracks. Practicing teachers with a master's can earn only the preliminary administrative services credential, while teachers with a bachelor's degree can complete the online master's in education administration program with or without the credential. The eight-course curriculum features coursework in political leadership, community engagement, and community engagement for school leaders. The program's flexibility attracts students from many professional and educational backgrounds. Students can earn the master's in five semesters; students pursuing only the administrative services credential graduate in four semesters. The hybrid program requires students to attend courses on campus three Saturdays each semester. The program uses a cohort learning model, and students take two courses per semester. All students work full time and complete a practicum experience at their place of employment. New cohorts start in the fall and spring. Competitive applicants hold a minimum 3.0 undergraduate GPA and at least five years of teaching experience. Applicants to the credentialing program must hold a California teaching certificate. Due to the program's on-campus components, Cal State Fullerton does not accept out-of-state students. However, international students who possess a U.S. student visa can apply. All students in the program pay the same per-credit tuition rate and fees. Fullerton is accredited by the Western Association of Schools and Colleges. The College of Education holds accreditation from the National Council for Accreditation of Teacher Education. The master of science in educational management program at UHCL prepares students for careers as principals, vice principals, and other education administrators. The hybrid program requires students to take some courses on campus. The synchronous curriculum requires 30 credit hours and comprises professional education courses, administration core courses, and a capstone experience. Students hone skills related to school law, appraisal of teaching, and the principal and school community relations. Throughout the program, students complete a practicum at their place of employment. The capstone experience involves a leadership research seminar during which students write a thesis on an education leadership topic. Faculty members possess expertise in areas including at-risk student populations, school turnaround, and administrator induction. On-campus courses take place in the evenings to accommodate full-time work schedules. The degree does not automatically confer an education administration endorsement in Texas or any other state. New students can start the program in the fall semester, and full-time students graduate in two years. Applicants without a minimum 3.0 undergraduate GPA must submit test scores. UHCL does not accept transfer credit. Texas residents receive a discounted tuition rate, and incoming graduate students with excellent undergraduate GPAs can apply for the Hawk Scholarship. UHCL holds accreditation from the Southern Association of Colleges and Schools. The College of Education is accredited by the Council for the Accreditation of Educator Preparation and the Texas State Board for Educator Certification. The online master of education in administration and supervision program at Liberty helps experienced teachers become effective administrators. Full-time students graduate in two years. Graduates with a teaching license and Virginia residency qualify for a school leadership endorsement. Graduates often work as principals, assistant principals, and curriculum instructors. The curriculum comprises 36 credit hours and includes advanced education core courses, administration and supervision courses, and professional courses. Students research school law, learning theory, and school-community relations. Learners also complete a one-semester internship under the guidance of a licensed and experienced school administrator. Although students take all courses online, the program requires three intensives on campus in Lynchburg, Virginia. Students must maintain a 3.0 GPA to remain in good academic standing. Prospective out-of-state students should research whether the program meets their state's requirements for additional endorsements. Prospective students can attend an orientation webinar to learn about Liberty and the program. Although not required, the university highly recommends that all applicants hold an active teaching license and significant experience. Applicants must hold a minimum 3.0 undergraduate GPA and submit one recommendation letter. Transfer students can apply up to 18 credit hours toward the degree. Liberty offers discounted tuition for active military personnel and veterans. Liberty holds accreditation from the Southern Association of Colleges and Schools. The online master's in education administration program holds accreditation from the Council for the Accreditation of Educator Preparation. Experienced K-12 teachers can pursue a master's degree in educational administration and supervision from BSU. The university enrolls more than 10,000 students in its online courses. Students work in education positions while completing the fully online program. The 36-credit curriculum features coursework in human resource development, supervision of instruction, and educational finance and ethics. Elective options include classes in the history of American education and multiethnic education in America. Students and professors meet remotely at scheduled times, typically in the evenings. During their second year, students complete two semester-long internships at their place of employment and a nearby school. Students spend 8-10 hours per week at internship sites, and all students intern in primary and secondary schools. Indiana residents who complete the online master's degree in educational administration receive an Indiana education administration credential. Out-of-state prospective students can use an interactive map on the university's website to determine whether the program fulfills their state's principal credentialing requirements. Each month, BSU hosts an evening webinar for prospective students. Applicants must hold an active teaching license and at least two years of experience. Indiana residents receive discounted a tuition rate, and all online students pay the same technology fees. BSU employees and their families receive significant tuition discounts. BSU holds accreditation from the Higher Learning Commission. Many experienced Oklahoma teachers pursue OU's master of education in educational administration, curriculum, and supervision to advance their careers. The online program includes limited hybrid components, but students can choose to take a higher percentage of courses on campus. In addition to positions as principals and vice principals, graduates often pursue careers as academic researchers, education advocates, and postsecondary teachers. The 36-credit curriculum features nine core courses and three electives. Core courses include school-level instructional leadership, education and the law, and politics in educational administration. One Saturday each month, students meet on the Norman campus for specialized instruction. Students choose between thesis and non-thesis tracks, the latter of which requires a portfolio comprising an extended narrative and work examples. Oklahoma graduates qualify for a principal certification endorsement. The program uses a cohort learning model, and students graduate in two years. All program faculty possess advanced degrees and extensive experience. Applicants must hold a bachelor's degree with at least 12 hours of education coursework. OU accepts applications on a rolling basis, but applicants for each annual fall cohort must apply by mid-April. Students pursuing the online master's in education administration may qualify for scholarships through the university and the Jeannine Rainbolt College of Education. OU holds accreditation from the Higher Learning Commission. The School of Education boasts accreditation from the National Council for Accreditation of Teacher Education. UT Tyler offers an online master of education with standard principal certification that is available only to Texas educators. The online M.Ed. includes a concentration in public school leadership and administration. Students gain competencies in areas including campus culture, ethical behavior, and staff evaluation. Full-time students graduate in 18 months. The 30-hour, synchronous curriculum boasts specialized coursework in instruction for school improvement, administration of special programs in schools, and educational leadership theory and practice. Students take 6-9 hours per term, which allows learners to work full time while earning their degree. The program features two practica during which students work alongside experienced administrators, who track and evaluate the students' progress. Applicants must hold a minimum 2.5 undergraduate GPA and Texas teacher certification in any subject area. Applicants with at least a 3.25 GPA do not need to submit GRE scores. Transfer students cannot apply previous credit to the degree. Students can enroll in the spring or summer term. Because the program accepts only Texas teachers, all students pay the same tuition rate. Students who are part of a minority group may qualify for the Gates Millennium Scholarship. The university offers tuition assistance for veterans. UT Tyler holds accreditation from the Southern Association of Colleges and Schools. A master's degree in education administration online is ideal for educators looking to build leadership skills and learn education management techniques. The curriculum teaches students how to budget, plan, manage, and lead school administration while working with the community. Online master's degrees in education administration offer flexibility to working teachers and educators. Programs vary between schools. Student Affairs Educators learn about the unique dynamic between students and teachers. Courses cover issues such as discipline, diversity, and leadership development. Educators will also explore the legal and ethical components of the educational system and community relations. Educators learn about stakeholders and how they impact the school system. Ideal for education coordinators and program directors. Enrollment Management This concentration is ideal for teachers considering a career in higher education. Educators are taught the science behind student enrollment, such as theory, research, and communication. The course outline teaches the importance of marketing management, financial budgeting, and planning. Students will also study the organization and administration of higher learning institutions. Ideal for director of admissions and dean of students. An online master's in education administration curriculum depends largely on the student's concentration. Different universities require a certain number of credit hours and specific classes. Below is an example of a master's degree in education administration online curriculum. Ethnography: This course can be taken by students with a concentration in higher education. Ethnography is an extension of anthropology, and this discipline explores culture, race, and ethnicity. Students will learn about various global cultures and how politics affect the relationships between ethnic groups. Education and Public Policy: This course teaches the unique history of the American educational system and social policy. Students develop an understanding of the politics behind educational policy, distribution of resources, and the current climate of educational policy. Students also perform analytical research and evaluation. Introduction to School Leadership: This course combines the principles of sociology and psychology to enable students to utilize and identify strategic leadership theories. Students learn how to deploy the appropriate problem-solving skills needed to lead academic institutions. Students will review theories like transformational leadership, team leadership, and psychodynamic theory as part of the curriculum.This course is fundamental for educators seeking an online master's degrees in education administration. HOW LONG DOES IT TAKE TO GET AN ONLINE MASTER'S IN EDUCATION ADMINISTRATION? Program concentration, course availability, and course load all affect the length of an online degree. Every online program has a required number of credit hours that students must earn. Students can usually choose to take program in a part-time or full-time format. It typically takes students two years to complete an online master's in education administration. Some programs allow each student to take courses on their own schedule. Typically, students in self-paced are given course assignments at the start of the program and they complete work as they go along. By contrast, a cohort program is a teaching model that involves group learning. Students are placed into groups and they complete assignments and take classes on a strict schedule. Professional Administrator License: A professional administrator license is for school principals and superintendents. Administrative specialists can also apply for this license. The prerequisite for a professional administrator license is a valid teaching license with at least two years of teaching experience. For educators applying for a superintendent license, they will need at least three years of experience in education administration. State boards perform a background check to verify the educator's experience. School Business Manager: Managers must earn a bachelor's degree in business or in a non-business field with at least 15 credit hours of accounting, office administration, purchasing, and risk management. Applicants may receive credit for taking other business-related courses as outlined by the state board. Applicants must also complete at least 300 hours of an internship under the supervision of a licensed school business manager. In order to receive national or regional accreditation, online master's programs for education administration must be evaluated by trusted educational authorities and agencies. The Council for Higher Education Accreditation (CHEA) works with the US Department of Education and US Congress to identify accredited institutions.The United States has six regional accreditation agencies. They are the MSA, NEASC, NCA, NAC, SACS, and the WASC. The four national accreditation agencies are the DETC, ACCSC, COE, TRACS. Look for these agencies when researching online master's degrees in education administration. National Accreditation is largely extended to vocational and trade schools. There is no standardization among programs at nationally accredited schools, and schools are reviewed every three to five years. Regional Accreditation is considered the highest distinguishment an educational institution can have. The Council for the Accreditation of Educator Preparation is an organization that specializes in teacher and educator accreditation. The council reviews departments at schools and colleges to ensure that the appropriate academic standards and requirements are met. It is a Federal agency that works in conjunction with the President and Congress to implement policy for the US educational system and provide financial assistance to institutions and individual students. CHEA is overseen by 20 university and college presidents that work with over 3,000 colleges and universities in the United States. The council holds conferences where they share data information regarding accredited schools. Students interested in exploring online master's degrees in education administration can research a college or university's accreditation by visiting the CHEA website. Education is of the most treasured commodities in the United States ― and because administrators play such an important role in our education system, the job outlook is quite strong for these professionals. According to the Bureau of Labor Statistics, most careers in educational administration are projected to grow by 8% to 11% between 2016 and 2026; by comparison, the average growth expectation for all industries is currently set at 5%. The table below looks at increase projections for four common career pathways in educational administration. As the table indicates, these four professions alone are predicted to grow by over 60,000 new jobs between 2016 and 2026. In addition to a favorable job outlook, educational administration master's degree-holders also enjoy relatively high earning potential. According to the 2015-16 PayScale College Salary Report, graduates with an educational administration master's earn a median annual salary of $53,900 during their first five years in the workforce and $74,400 after a decade on the job. This represents a 38% earnings increase during that 10-year period. How does educational administration stack up against other master's education fields in terms of salary expectations for new graduates? The table below features a 10-year earnings outlook for five of the most popular master's fields related to education. Of these five career fields, education administration ranks first in terms of both entry-level and mid-career salary. However, earning potential for educational administration master's recipients will also depend on specific job title, as well as other factors like school/district size and city/state of employment. The next table uses PayScale data to explore the 20-year salary growth expectations of five different administration-oriented careers in education. Of the five careers listed, elementary school principal experienced the highest rate of career salary growth: a 43% increase between the entry-level and late-career benchmarks. Academic Deans placed second with 35% earnings growth, followed by school superintendents with 24% growth. Students who graduate with a master's in educational administration and complete their state's licensure requirements will be qualified for dozens of positions at the K-12 and/or postsecondary level, particularly if they have earned a degree specialization. Four popular careers in educational administration are outlined below. K-12 Principals: Principals monitor all daily operations and activities at elementary, middle and high schools. Most principals begin their careers in teaching, and then advance to the administrative title after completing a master's program; principals who work at public schools must be licensed in all 50 states, and many private school principals are licensed, as well. Postsecondary Administrators: These administrators oversee the operations at colleges and universities of all sizes. Administrative roles at the postsecondary level include deans, registrars, student administrators, and admissions officers. A Ph.D. is often required for administrative positions at the collegiate level, although many master's degree-holders can land entry-level jobs and quickly advance. Preschool and Childcare Center Directors: These directors manage learning facilities designed for children before they reach kindergarten age. Most positions will be given to candidates with at least an associate or bachelor's degree, so master's recipients are in a good position to compete for top jobs. In most states, preschool and childcare center directors must be licensed and receive CPR/first aid training. Instructional Coordinators: Instructional coordinators write and evaluate the curricula used in elementary, secondary and postsecondary institutions. They work hand-in-hand with principals and other administrators to ensure lesson plans are effective and engaging for students. Instructional coordinators who work in public schools must earn a license in some (but not all) U.S. states. Making professional connections and learning about different educational approaches is crucial to your success. Professional organizations offer a great entry point for students who want to learn more about their chosen career path. Below you'll find three of the country's most prominent organizations established for education administration professionals. These organizations host networking events, provide online trainings, maintain active job boards, and offer other services for career-ready college graduates. Resources like these often prove invaluable as you complete your degree requirements and prepare to enter the job market. National Association of Secondary School Principals: Celebrating its 100th birthday in 2016, the NASSP is today represented by principals, assistant principals and other middle/high school administrative personnel in 35 different countries. The organization hosts networking functions, offers continuing education programs and gives members the opportunity to become advocates in different key areas of secondary school administration. National Association of Elementary School Principals: Founded in 1921, the NAESP today serves elementary school principals and administrative personnel in the U.S., Canada and overseas. The organization's online learning center features webinars, tutorials and links for classroom-based training programs; an online resource library is also available. Association of Deans & Directors of University Colleges & Undergraduate Studies: This nonprofit organization that represents deans and administrative personnel at postsecondary institutions across the country. The AD&D hosts an annual conference at a different U.S. location each year, and offers both individual and institutional memberships. Our list of scholarships and grants specifically aimed at education majors includes 43 individual rewards totalling more than $170,000 in financial aid. Browse our database to learn more about accessing free money to pay for your online teaching master's degree.